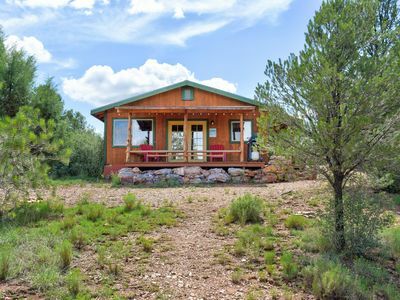 We are surrounded by working cattle ranches, a GREEN FOREST of pinion pines and cedars, close to ancient Native American ceremonial sites, and Route 66. Enjoy the TRANQUIL, captivating views of surrounding MOUNTAINS from any room in the house through sixteen large windows and four garden doors. 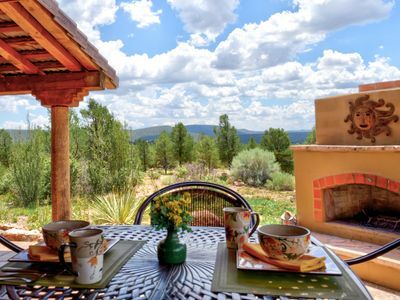 Have your favorite morning beverage on the 71 foot covered patio where you can listen to the birds, fill your senses with the wonderful fragrances of the countryside and watch the occasional deer pass by. You may also choose to get on the trails available on our 80 acres for an early morning hike. Favorite evening activities include gathering around the outdoor FIREPLACE, roasting marshmallows while STARGAZING, storytelling, and toasting the day’s events. Our guests tell us that we offer much more than the average vacation rental. This COMFORTABLE, spacious home, which features a charming RUSTIC “cowboy” motif throughout, is thoughtfully furnished and adorned. It’s cozy for a couple or small family and the layout is also perfect for extended family gatherings or groups of friends who would like to spend quality time together. We’re conveniently located in the Juniper Mountains between Las Vegas and the Grand Canyon, 55 miles west of Williams, close to Seligman, the BIRTHPLACE OF ROUTE 66. The climate is moderate, year round, with few exceptions. We are at 5800 feet elevation and though we get some beautiful SNOWFALL a few times each season. WILDLIFE commonly seen include elk, deer, javalina, antelope, coyote, bobcat, and wild burros. As your hosts, we try to make this your BEST VACATION EVER. Guests who stay with us become friends and often return multiple times. They love the home and the surrounding area, which has so much to offer. Take a few extra days if possible, you will find your visit very rewarding. “The house was everything described and more. 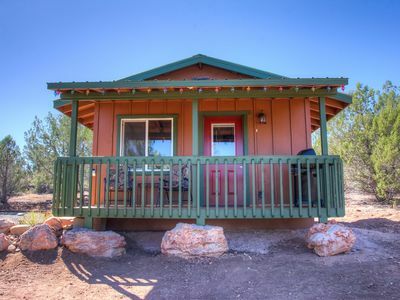 I recommend this home to anyone interested in truly getting away from the concrete jungle. You will not be disappointed. Thanks Don and Carolyn!” — Guest review titled ‘Awesome, simply awesome’ by Doug W.
“We normally stay in 5-star hotels and this home certainly met our expectations for a high quality, comfortable atmosphere. We were only there for 3 nights and will definitely book a longer stay next time.” — Guest review titled ‘Wonderful!’ by Pat R.
“We couldn't have asked for a more peaceful, beautiful place to unwind and see some local sights!” — Guest review titled ’Absolutely Magical! !’ from Ann D.
“I really can't stress adequately enough how clean, lovely, and obviously very well-cared for that the home was. We enjoyed our stay very much.” — Guest review titled ‘Beautiful, secluded, relaxing’ from Jana B. “Clean, great kitchen/dining area, amazing views, and spacious accommodations. The living room and game room have lovely log fireplaces and large picture windows. Everyone enjoyed using the well stocked game room (with bar area) and pool table. The house layout was fabulous for multiple parties/families. Facilities were well beyond our expectations. Furniture was large and plush. Beds and bedding were extremely comfortable and good quality. There is a large patio that wraps around the front of the house that has both a fireplace and grill that we found most useful. As experienced international travelers we can highly recommend this property. - Guest review titled ‘April2017’ by Susan P.
“This is really an ideal place for a family gathering. All the beds were comfortable and the closets were large. Everything was clean and well laid out. — Guest review titled ‘Wonderful Place to Stay’ by Nancy S.
Consider taking the PETROGLYPH VALLEY TOUR while you’re here! Arriving at the site, you will see an abundance of ancient petroglyphs carved into the stunning rock cliff formations. Many of the carvings predate the arrival of any white explorers or settlers. You’ll also hike to a location where Native American Indians (Yavapai Apache) crafted pottery pieces by hand, remnants of which still litter the canyon floor. The tour takes approximately 4 - 4.5 hours. Guests are expected to bring their own snacks and drinks. Feel free to ask us for more information about our property or any points of interest in the area!